Ouch! — who’s got the video camera? It was one of those moments where you just wished someone had a video camera handy. 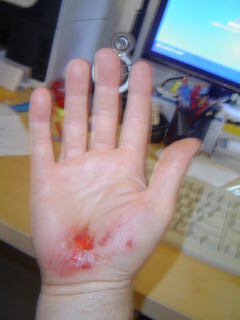 Skateboard three days old … careening down a hill … my dog stops running in front of me and I have no option but to go over the top of him, doing a hard landing on the road. Ouch! I would love to see the footage. It was a shame no one was around to watch. Skateboard and dog are just fine. I have grazes on my hands, left shoulder and hip, and both knees. The worst injury is my right hand (see pic), but even that is not too bad. And yes, I did get back on the skateboard and ride it home! This entry was posted in Skateboards and tagged Skateboard on 25 September 2007 by Rex.